If you want to experience the best Beatles tribute ever, you won’t want to miss The Fab Four - The Ultimate Tribute returning to the Capitol Theatre. The Emmy® Award-winning Fab Four is elevated far above every other Beatles tribute due to their precise attention to detail. With three costume changes representing every era of the Beatles ever-changing career and uncanny, note-for-note live renditions of Beatles’ classics such as "Can’t Buy Me Love", "Yesterday", "A Day In The Life", "Twist And Shout", "Here Comes The Sun" and "Hey Jude", the Fab Four will make you think you are watching the real thing. The Fab Four is truly the ultimate tribute! Tickets are $65.50, $49.50, and $36.50. Performance is at the Capitol Theatre, 405 Cleveland St, Downtown Clearwater. 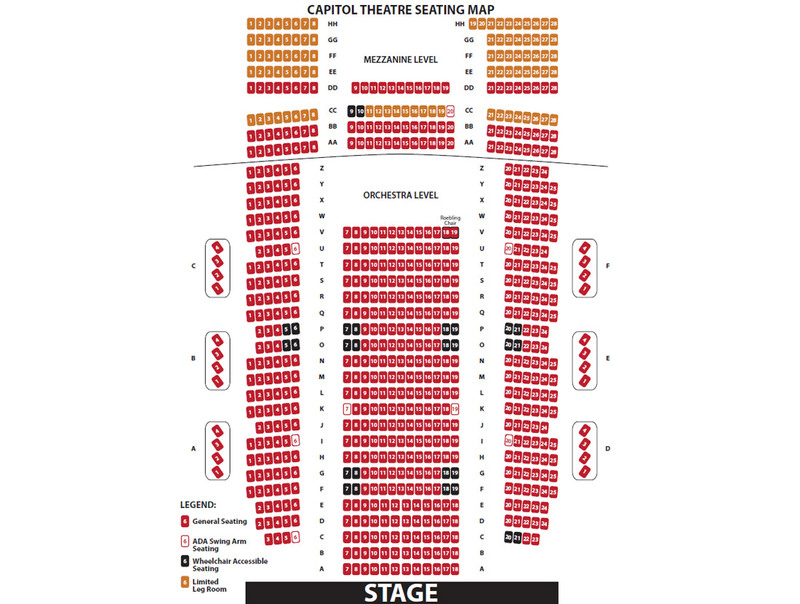 Experience the elegance and privacy of one of our exclusive Capitol Theatre Luxury Boxes. Amenities include a private box for four with a unique perspective of the stage in the beautifully restored Capitol Theatre. Luxury boxes include access to our Exclusive VIP Lounge where complimentary wine, champagne, soft drinks and snacks will be provided. Convenient valet parking is also included. Enjoy Downtown Dining Before the Show! The Capitol Theatre has partnered with the renowned Clear Sky on Cleveland to offer a delicious premium dining and entertainment experience! There are two menu options for the dinner packages and include a premium seat for the show with convenient dining before the show! Clear Sky on Cleveland is located directly across the street from the Capitol and remains open until 11pm (Please note: kitchen closes at 10pm). A variety of restaurants are located within walking distance to the Capitol Theatre. Visit the Downtown Clearwater website for more information. *The Frenchy’s Rooftop Terrace Lounge is open for select Capitol Theatre shows, weather permitting. A variety of draft and canned beers and a full liquor bar available. Main concessions include popcorn, pretzels, assorted chips, assorted candy and soft drinks. Members enjoy a private VIP Lounge with exclusive access to delicious hors d’oeuvres, a full liquor bar and access to a private balcony with a gorgeous view of Downtown Clearwater and Clearwater Beach. The Capitol Theatre is located at the corner of Cleveland St and Osceola Ave in Downtown Clearwater. Parking is available, free of charge at the City Hall parking lot, The Harborview Center (event permitting) and all City street parking lots and meters after business hours and all day on weekends. Valet parking is offered directly in front of the Capitol Theatre for a fee. From St. Petersburg – Head north on I-275 towards Roosevelt Blvd (SR 686); head west and follow signs to St. Petersburg-Clearwater International Airport. Cross the Bayside Bridge. Take the Gulf to Bay Blvd exit (SR 60). Use the left 2 lanes to turn left (west) onto Gulf to Bay Blvd (SR 60), towards Clearwater/Clearwater Beach. Gulf to Bay Blvd turns into Court St. Turn right onto Ft. Harrison Ave (heading south). Turn left (heading west) onto Cleveland St. The Capitol Theatre will be located on your left hand side, at the corner of Cleveland St and Osceola Ave.
From Tampa – Head west on the Courtney Campbell Causeway (SR 60) towards Clearwater Beach. Continue on Gulf to Bay Blvd (SR 60), towards Clearwater/Clearwater Beach. Gulf to Bay Blvd turns into Court St. Turn right onto Ft. Harrison Ave (heading south). Turn left (heading west) onto Cleveland St. The Capitol Theatre will be located on your left hand side, at the corner of Cleveland St and Osceola Ave.
From Tarpon Springs/Palm Harbor – Drive south on East Lake Rd (SR 611). East Lake Rd becomes McMullen Booth Rd. Turn right (west) onto Gulf to Bay Blvd (SR 60). Gulf to Bay Blvd turns into Court St. Turn right onto Ft. Harrison Ave (heading south). Turn left (heading west) onto Cleveland St. The Capitol Theatre will be located on your left hand side, at the corner of Cleveland St and Osceola Ave.
Ruth Eckerd Hall is committed to providing an accessible building and pleasurable performance experience to every member of our audience and staff. Special accommodations (ie. aisle seats, ramp access, space for a service dog, etc.) should be requested at time of purchase. Wheelchair locations with companion seats are available for all performances. Limited availability. Please order early. On the Ruth Eckerd Hall campus, disabled parking places are located around the facility on a first come - first served basis. They are clearly marked; for additional assistance, please ask a parking lot attendant for direction. There are designated drop-off points at each entrance for easy access to the lobbies. At the Capitol Theatre, the City of Clearwater provides public parking on the street and in local lots in the area. Patrons are welcome to use valet service when available at 50% off by presenting their disabled parking permit. Elevators are available at the ground level accessing the Ruth Eckerd Hall upper lobbies, the Margarete Heye Great Room, the Dimmitt Atrium Lounge, the Hoffman Dress Circle Room and the Marcia P. Hoffman School of the Arts. The Capitol Theatre elevator is located on the west side of the building. If you require a sign language interpreter, please submit a written request to the Patron Services Manager at least four (4) weeks prior to the event date. Mail requests to: Patron Services Manager, Ruth Eckerd Hall, Clearwater, FL 33759. For more information, call Patron Services at 727.712.2707. Patrons with a hearing disability may enjoy use of our state-of-the-art infrared Assistive Listening Device system free of charge. Listeners use a compact, portable receiver and earphones to hear clearly and easily from anywhere in the seating area. Please note, you will need to leave a driver's license or a credit card until the listening device is returned. Please speak to an usher at the Information Station to request an Assistive Listening Device. Accessible restrooms are located near all event spaces, classrooms and administrative offices. For more information or to schedule a tour of the facility, please call Patron Services at 727.791.7060 ext 4104.